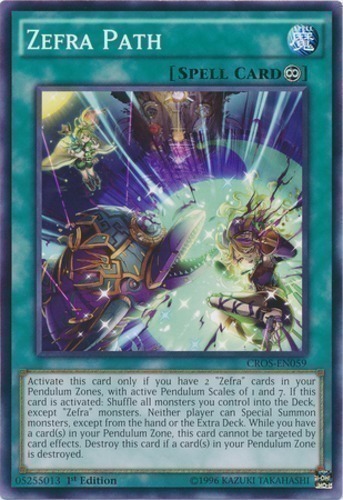 Activate this card only if you have 2 "Zefra" cards in your Pendulum Zones, with active Pendulum Scales of 1 and 7. If this card is activated: Shuffle all monsters you control into the Deck, except "Zefra" monsters. Neither player can Special Summon monsters, except from the hand or Extra Deck. While you have a card(s) in your Pendulum Zone, this card cannot be targeted by card effects. Destroy this card if a card(s) in your Pendulum Zone is destroyed.